Welcome to ‘generation debt’! It is hard to find anybody these days that is not in some form of debt. Be it student loans, credit card debts, overdrafts or mortgage repayments. The large majority of people are struggling to get themselves out of the red and into the black. Today’s post will give you some key tips on how to jumpstart your personal finances, save money and avoid becoming another statistic. Or at the very least help you escape what debt you already find yourself in. Be smart and always ask yourself “do I need this?” before you buy anything. It is important to distinguish between wanting something and needing something. It is alright to treat yourself occasionally but do not waste money you barely have. The key is to budget and not become somebody who carelessly spends money without assessing the repercussions. While many people have multiple bank accounts, you should have at least two accounts. A checking account and a savings account. A great tip that everybody should use is the 10% rule. Pay yourself first, be it weekly or monthly you should put 10% of your wages into your savings account. Pay attention to the interest rates in your savings account and watch your money grow. Do not touch this money unless absolutely necessary, and should the worst happen you will know you have money to get by on for a little while at least. The first thing you do with your income is pay for essentials, such as any bills you have, rent, mortgage payments, groceries, clothing you may need, basics around the house etc. Once you have paid for everything you need you can think about buying something you want. Once you have put 10% of your wages into your savings account and have paid for your essentials you can treat yourself. However if you really want to jumpstart your personal finances you need to be smart about how you spend money on even the little things. A muffin every morning from the local cafe will add up, as will eating out at a restaurant each evening. Why not just make muffins at home and take one with you in the morning, and cook yourself dinner at night? You do not have to live on the bare minimum but do not be lavish either. If you jumpstart your personal finances now there is plenty of time to treat yourself in the future once your finances are on a strong foundation. We live in the era of plastic money – credit cards are incredibly attractive to most people. You can buy what you want now and worry about paying for it later. There is nothing wrong with using credit cards if you follow some very easy rules. You should try to only use a credit card when you know you will be able to pay off the entire balance before you incur any charges. If you do not have the money then do not spend the money! It really is that simple. If you find yourself needing to use your credit card for an emergency then pay attention to the interest rates. If you fail to pay off the entire balance in time this percentage will be added to the bill and it can very easily get to the stage where you can barely afford to pay off the minimum amount each month meaning the initial amount remains and you are not even putting a dent in it. If you find yourself in a situation where you are unable to pay off the entire amount in time, at least pay off as much as possible so the money you throw away in interest is lessened and you start to chop the overall amount down in size. A great way to pinpoint areas you are wasting your money on is to take note of everything you buy for a couple of weeks. At the end of this time add everything up and notice the things you are spending money on that are truly unnecessary. Saving money is not something reserved for older people. If you start now you will reap the rewards soon enough. Take it from somebody who knows, there is nothing more crushing than the feeling of unaffordable debts. 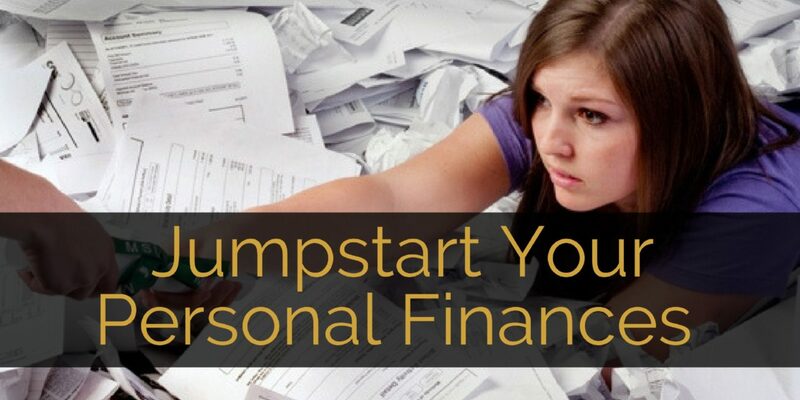 Jumpstart your personal finances now and secure a less anxious future.